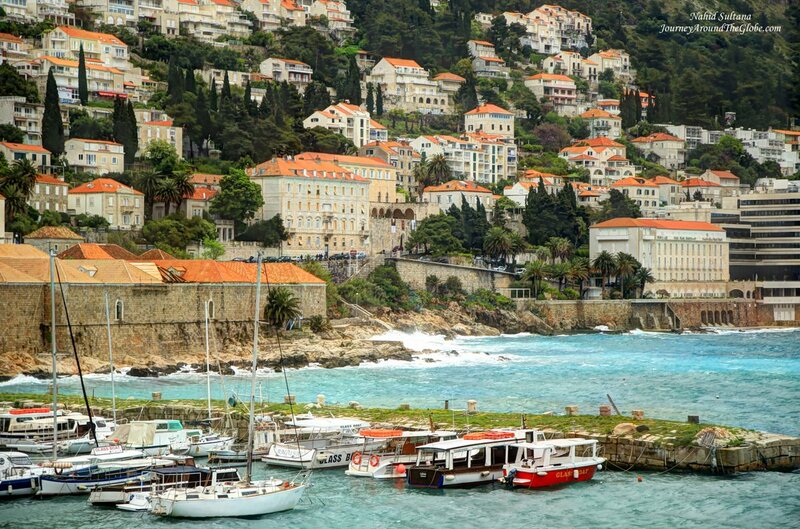 DUBROVNIK, CROATIA: Dubrovnik, frequently known as “City of Stone and Light” doesn’t need much of introduction. 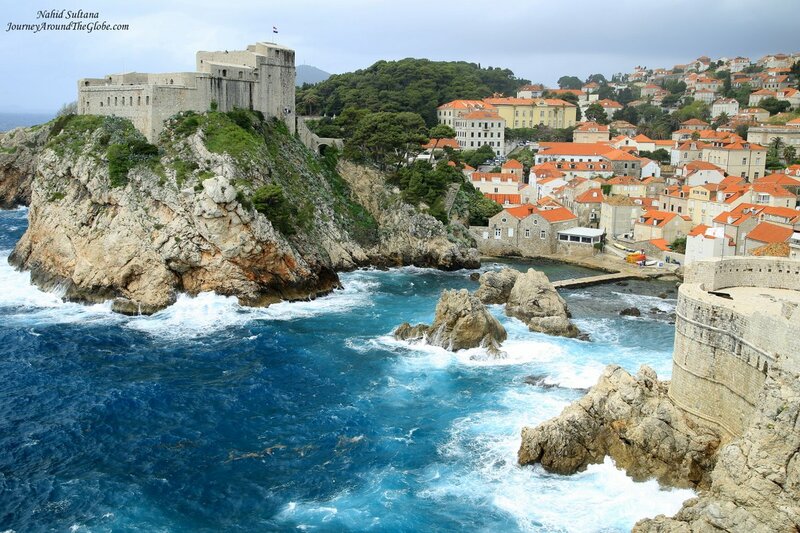 It’s the home of HBO’s Game of Throne, one of the world’s top ten wedding destinations, abundance of breathtaking vistas, and coastline walks. And it’s an old city by the Adriatic Sea or as they call it “Pearl of the Adriatic”. It’s a prominent and elite tourist destination in Eastern Europe and all Mediterranean. No wonder George Bernard Shaw said “those who seek paradise on earth should come to Dubrovnik and find it”. Around 7th century, this portion of land was under the protection of the Byzantium. Following the Crusades, Venice took over, and then Croatian-Hungarian kingdom. 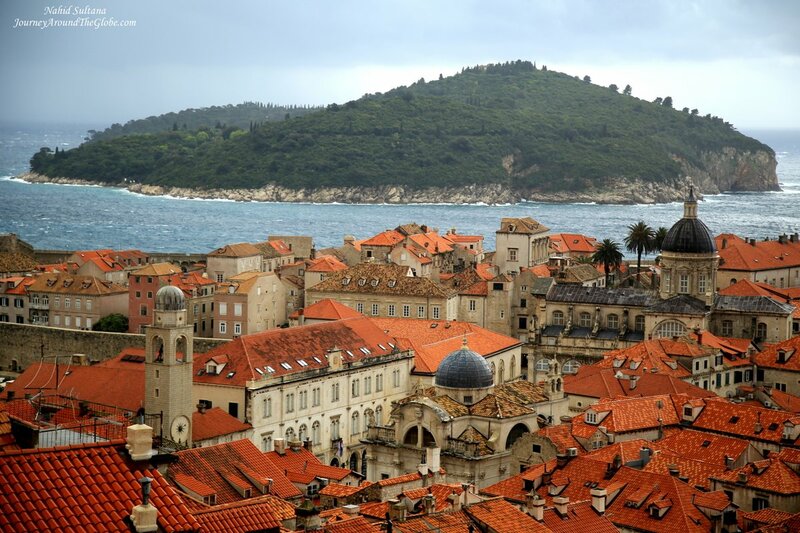 In the 14th century, the nobles of Dubrovnik bargained their freedom, and this become a city-state which flourished for four centuries, maintaining independence from invaders such as the Turks. Dubrovnik became such a powerful force in the Adriatic that it seriously rivalled Venice’s dominance in the region. Those golden days lasted until the beginning of the 19th century when the nobles here were tricked by Napoleon to letting his armies into the city in 1806. Dubrovnik was one of the most prosperous and advanced maritime republics of all time. 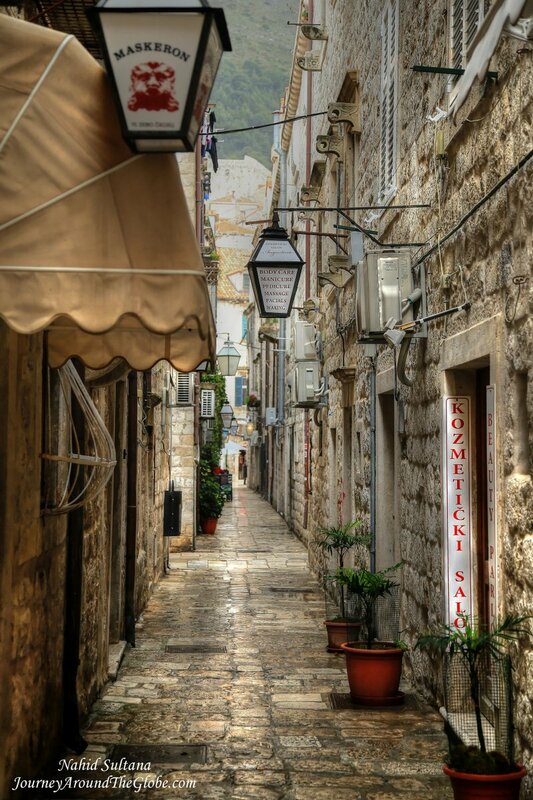 Its Old Town is the witness of impressive economic, social, and cultural achievements of Dubrovnik over the centuries. During the disintegration of Former Yugoslavia, the Republic of Serbia and Montenegro and the Yugoslav National Army commenced their aggression on Croatia. The brutal aggression on the city and the southern part of Croatia was part of the master-plan of the so-called Great Serbia. 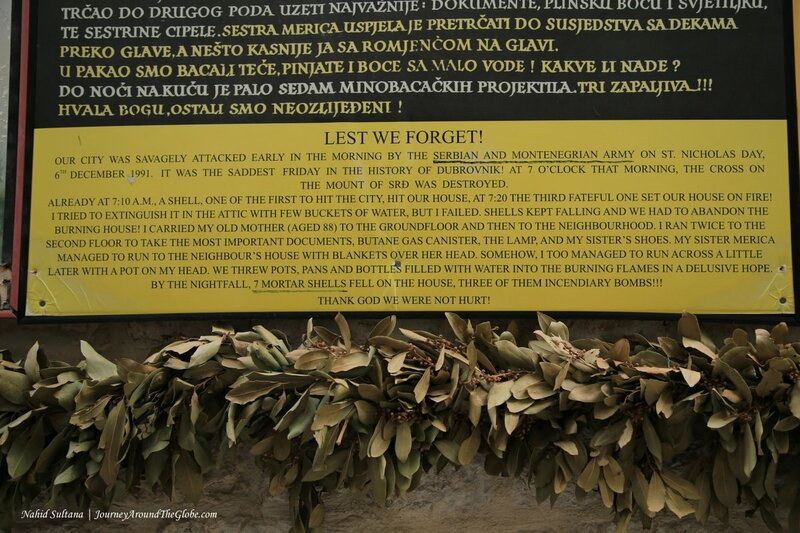 Many sites were damaged by the aggression on Dubrovnik by the Yugoslav army, the Serbs, and the Montenegrins in 1991 – 1992. In October 1991, the attack on Dubrovnik and the surrounding region was initiated from land, sea, and air. The southern part of Croatia was liberated in October of 1992. 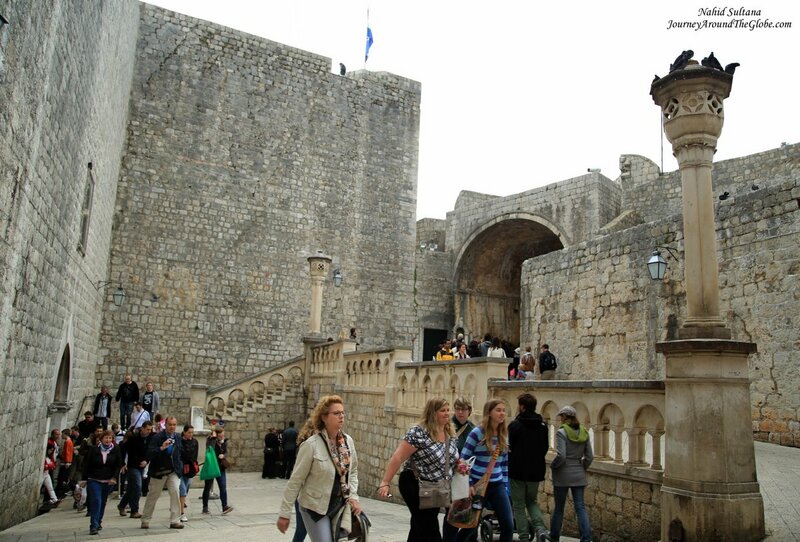 During this period, the City of Dubrovnik and its citizens underwent one of the greatest hardship in its history. Dubrovnik managed to retain its identity, uniqueness, and spirit throughout the long siege, without water and electricity, and cut off from the rest of Croatia and the world. The heroism of the city towards the daily bombardment the systematic destruction of world heritage monuments, and the suffering of its citizens living in shelters, as well as the courage demonstrated by the Croatian defenders and by many of the citizens involved in the resistance efforts of Dubrovnik, portray the brighter side of the Homeland War. The enemy blockade of the immediate area of the City of Dubrovnik lasted up until July 1992. In spite of Croatia’s international recognition, intermittent attacks on the Dubrovnik region continued until the summer of 1995. Between October 1991 to August 1995, more than 200 Croatian defenders died throughout the entire Dubrovnik region – soldiers, policemen, and sailors. More than 100 civilians died during the numerous attacks on Dubrovnik and its regions. 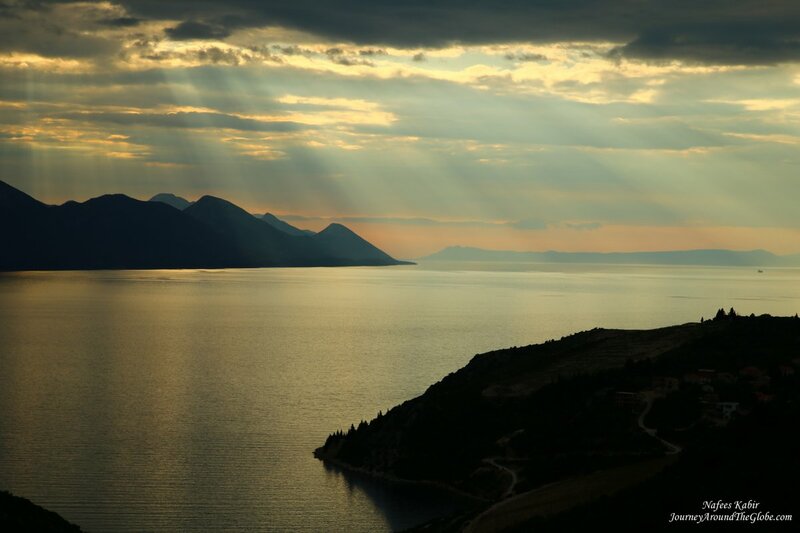 More than 300 people from the Dubrovnik region were incarcerated and tortured months in the prisoner camps that were set up the Yugoslav National Army in Montenegro and eastern Herzegovina. Due to the aggression in the southernmost part of Croatia, about 33,000 people had to flee their homes. TIME of TRAVEL: Dubrovnik was the last stop of our Easter Break 2014 trip. We visited Podgorica, Tirana, Skopje, Pristina, and Sarajevo before coming to Dubrovnik. First two days weather was beautiful but the last day when we were walking on the old fort’s walls, we were hit by heavy showers and hails for a little while. After that the sky got clear but gloominess didn’t go away. On an average it was a bit cold and wet during our visit but the best part was that we could avoid the massive summer crowd at this time. OUR HOTEL: Our hotel in Dubrovnik was fabulous Royal Princess Hotel by the Adriatic Sea. It’s a Five-Star ocean-front hotel and our family suite had a breathtaking view of the blue water. We could stand on the balcony and look at the limitless water at sunrise and sunset. We had free extraordinary breakfast buffet and Wi-Fi. Parking garage was available and bus-stand to the city center was only 3 minutes’ walk. Reception also had reduced bus tickets at their counter. We didn’t have to go too far for dinners either; there were few different restaurant options inside the hotel compound including a Mediterranean buffet. Overall, everything was just perfect in this hotel. 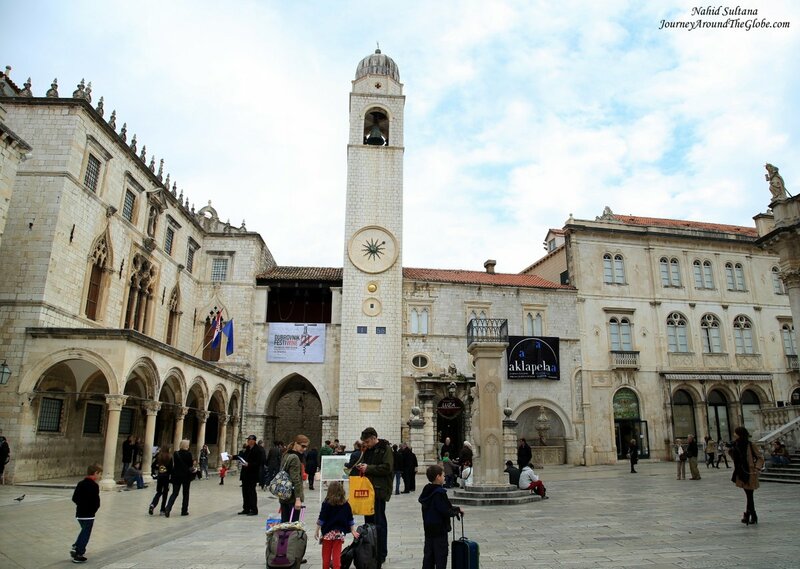 EATING and SHOPPING: Stradun is one of the best place for meal or drink. Sit down in one of the already-overcrowded cafes or restaurant and have some relaxed moments. Classic Dubrovnik cuisines are seasoned with parsley, garlic, olive oil, and lemon, and perhaps a touch of rosemary or bay leaf. You can get a true Mediterranean experience in their dishes. We usually came back to our hotel during the dinner time and since our hotel had more than just one option for meal, we explored few different restaurants at the end of each day. For our 1st lunch, we stopped at “Poklisar” in Old Town by the marina where daily boats leave for different trips. Their food was fantastic and had different variety of dishes, like pizza, pasta, salad, soup, and a nice selection of local traditional dishes. Also best part of this restaurant is that they don’t use any GMO products and all the ingredients are locally grown. 2nd lunch was at “Mea Culpa”, a bistro/trattoria also in Old Town on one of the smaller streets. This is known to be a good pizzeria with endless options of pizza, pasta, risotto, salad, and lasagna. Most of the shops we saw are in the Old Town…some on Stradun and some on the off of Stradun in the smaller alleys. We saw canisters with Croatian maps, dolls with traditional dresses, and other generic gifts items almost in every store. For us, we bought a large print of painting near the Aquarium by marina. 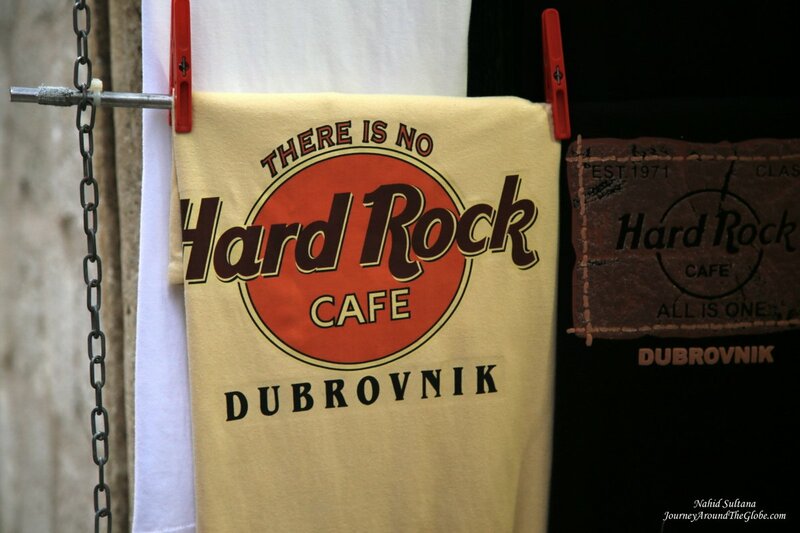 How about that for a souvenir from Dubrovnik, Croatia? PLACES WE’VE VISITED: The love of beauty is visible with every step in the Old Town; this is a living museum and famous UNESCO World Heritage site. Although this portion of Dubrovnik was heavily bombed during the Yugoslavian war in the early 90s, the city came back to its original glorious look very soon. But you can still see some bullet holes and damages around the Old Town. Almost 3000 people live in Old Town now, some for many generations. Some of the streets here can be steep and uneven, make sure to wear comfortable walking shoes. Old Town of Dubrovnik can easily be covered on foot. Something you should notice in the old part that most of the stores in the small alleys have lamps above their entrances that mention the name of those stores…pretty unique. We didn’t have chance to go Rector’s Palace…one of the loveliest 15th century buildings in the city which once was the palace of Major Council, is now a Cultural History Museum. Here you can view the richly appointed offices and quarters of the Rector, arsenal, courtroom, and prison cells. The city also has number of good museums and historic landmarks and buildings. If you have more time in Dubrovnik, enjoy some of the finest beaches of the city. If you want to experience the tranquility of island life, you don’t have to go too far. Although we couldn’t manage to go, the island of Lokrum is a mere 15 minute boat cruise from the Old Town. The shores are rocky but it’s known to have some of the best swimming spots. Benedict monks in the 11th century built a monastery in this island. Austrian Archduke Ferdinand Maximillian Joseph built a summer house here and a botanical garden was founded in the late 1920s. 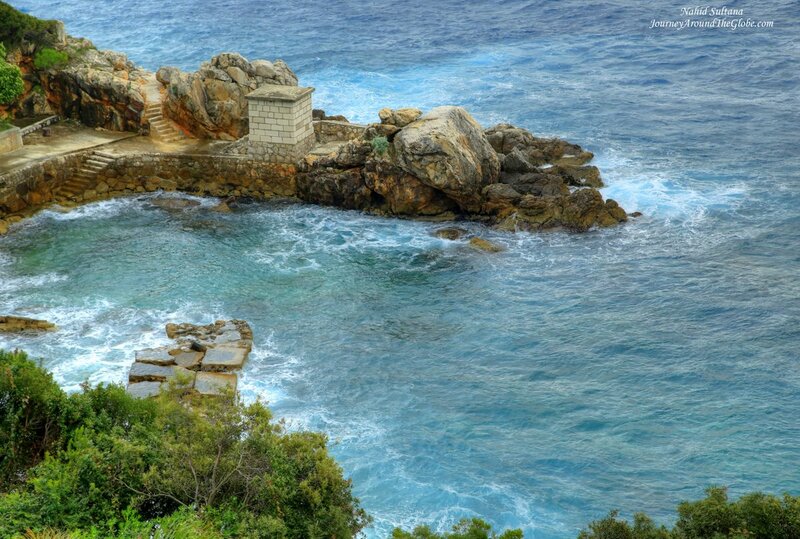 Lokrum is a Nature Reserve now. You can supposedly get the best view from its star-shaped fort on the hill, built by the French in 1806. 1) PILE GATE and BIG ONOFRIUS FOUNTAIN: Near Pile Gate we got off the bus#6 on our first day. After crossing a stone bridge that ends in a drawbridge spanning the old moat (now filled with park benches and trees), we entered to Old Town thru Pile Gate. This is a nice starting point to stroll through the Old Town. Both Pile and Ploce gate (another gate to enter Old Town) are masterpieces with reliefs of St. Blaise, protector of the city, above the gates. One of the first spectacular sights that greets you when you enter Stradun from the Pile Gate is the Great Onoforio Fountain with its huge central dome and 16 water taps all around. A ledge and steps around the water trough provide a perfect resting spot for tired sightseers and pigeons or meeting place for the local youth. This old fountain is at the western end of Stradun (the main pedestrian street). There is another “Onoforio”, called Small Onoforio, an elegant masterpiece decorated with playful dolphins near the tower at the other end of Stradun. 2) CHURCH of ST. SAVIOUR: After entering the Old City from the Pile Gate, this is the first church we saw opposite of Great Onoforio Fountain. It was closed at first but we came back the next day and went inside then. Thank god that we had the chance of seeing its inner beauty. It was built around 1520 – it is said that even the city’s aristocratic ladies helped with carrying wood and stone. 3) FRANCISCAN MONASTERY and OLD PHARMACY: Right beside Church of St. Savior is this monastery with Baroque church. The Romanesque cloister of Franciscan Monastery is an absolute delight, guarded by delicate columns and decorated with the remnants of old frescoes, a garden where orange trees grow. The monastery is most famous for its pharmacy. This is among the oldest in Europe, 3rd oldest in the world, and the oldest one still working. The pharmacy houses many old paintings, artifacts from the 15th/16th century. In the museum of monastery, you can see the original items from the pharmacy, plus an extensive library with manuscripts, a large collection of musical notations and a treasury of artworks. Interesting thing we noticed inside the monastery was you can still see some damages that Serbian army caused during the war of 1999. The museum of monastery is open from 9 – 6 and costs 30 kn/4 euros per person. 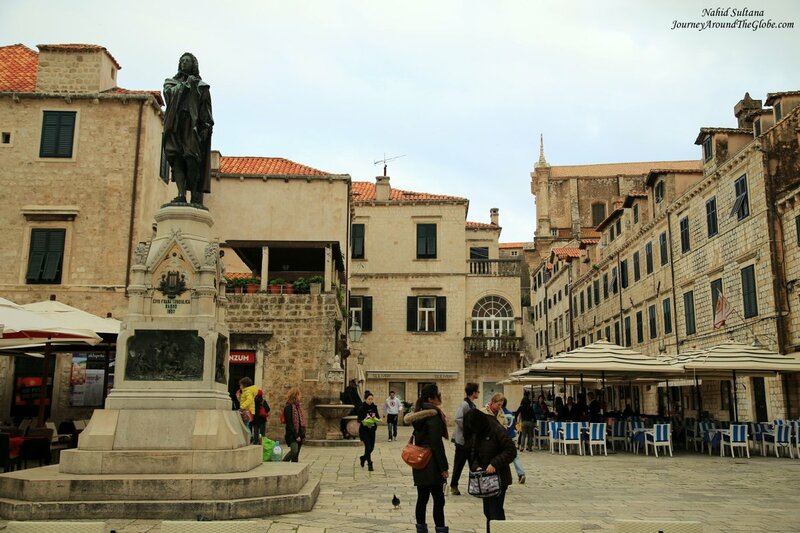 4) STRADUN, PLACA: Stradun is not usually in the maps of Dubrovnik (may be in some), it’s the unofficial name for the main pedestrian street that joins two main entrance to the Old Town. This is the spine of Old Town you can say with uniform Baroque buildings on both sides. It’s here where visitors usually come to take a stroll or for an evening coffee time. You will find countless cafes, restaurants, shops, and boutiques on this long stretch of street. Wander off to one of many smaller alleys from Stradun; some of the best eateries with nice atmosphere can be found in these alleys. Today, Placa is the shopping center and venue of major events. 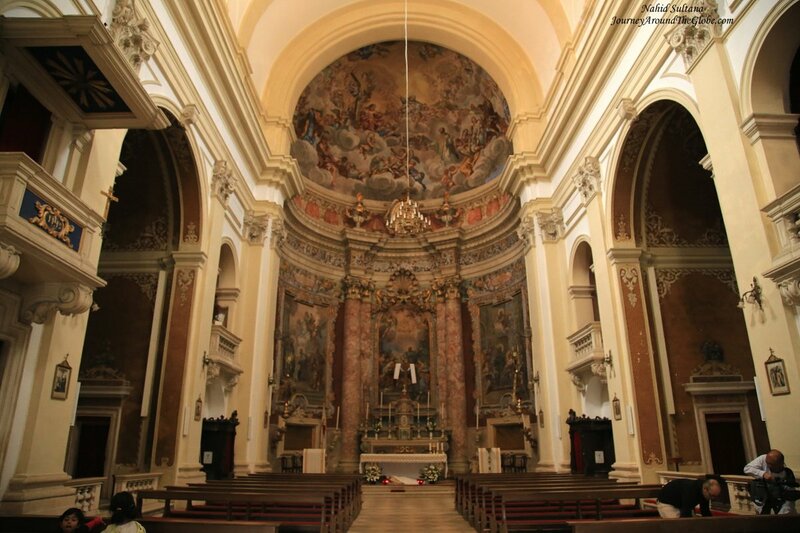 5) ST. IGNATIUS of LOYOLA: We took a smaller alleys off of Stradun and started walking leisurely towards this church. St. Ignatius church was designed by a Roman architecture based on the church of St. Ignatius in Rome. Construction started in 1699 and was completed in 1725. This is a wonderfully ornate Jesuit church with marvelous ceiling, dome, and paintings. The sanctuary was painted by a Sicilian artist. The ceiling of the dome represents the glory of St. Ignatius. There are four side altars in the church. Near the entrance, on the right, is the grotto of Our Lady of Lourdes, one of the oldest grottos built in Europe (1885). 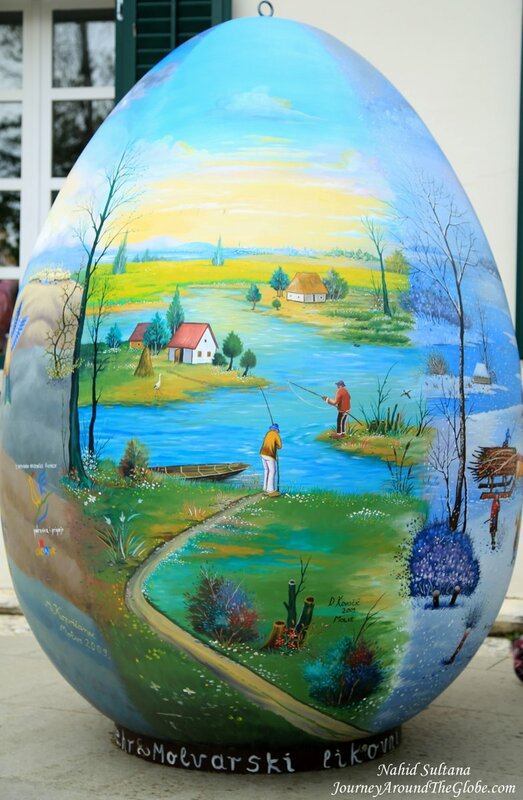 Its present appearance is the work of a Croatian artist from 1966. The church is on a fine complex on an elevated square close to the southern edge of Old Town. We approached the church via romantic 18th century Baroque staircase which is modelled on the Spanish Steps in Rome. Both the staircase and the square in front of the church are atmospheric spots in the oldest part of the city. The church is located closer to the east end of Stradun and there is no fee to enter. 6) DUBROVNIK CATHEDRAL: This is the beauty and the pride of Dubrovnik. With its imposing forms and beauty it dominates the core of the Old Town. Its dome gracefully tops the skyline whichever way you look at it. This white Baroque building glitters in the center and its lovely dome rises above other buildings. The cathedral is closely connected with the history of Dubrovnik, and it reflects all the periods in town’s past: its rise, destruction, and rebirth in the course of thousand years of long history. The cathedral is most famous for its collection of treasures. The cathedral was built in 1713 on an early Romanesque cathedral from the 12 century. But after an earthquake in 1979, more excavations showed that there was an even earlier Byzantine cathedral from the 7th or 8th century. The present day Baroque cathedral, the third church built on the same site was built between 1672 – 1713 on the remains of the former Romanesque cathedral, which was erected between 1131 – 1157 and destroyed by a disastrous earthquake in 1667. In 1979, another earthquake hit Dubrovnik which considerably damaged the Baroque cathedral which had to be repaired. 7) CITY BELL TOWER, CITY HALL, and ORLANDO’S COLUMN: The Bell Tower crowns the east end of Stradun and we could see it all the way from the west end as soon as we entered Old Town thru Pile Gate. If you look carefully you’ll notice the figures of two men, called “The Green Ones” poised with hammers. Bell is the only original part of the tower – an older one dating back to 1444 was destroyed and rebuilt in 1928 and it weighs two tons. The gigantic bell is rung every hour. On the eastern end of Stradun begins a remarkable chain of buildings. City Hall is one of those buildings next to City Bell Tower and opposite of St. Blaise Church. An old Arsenal and Marin Drzic Theatre are part of this complex. At one end of Stradun, near St. Blaise, and in front of Bell Tower stand a column with a carving of Orlando (or Rolando), a legendary knight embodying freedom and nobility. We saw statues of Rolando in various Hanseatic League statues in Germany, like Bremen. This one in Dubrovnik was raised in 1418. This spot once was the marketplace and the “political” heart of the city. 8) SPONZA: Next to Bell Tower is the grand entrance of Sponza, a Gothic Renaissance palace. This is one of the few buildings that survived catastrophic 1667 earthquake. The City of Dubrovnik dedicated a memorial Room, called “The Memorial Room of Dubrovnik Defenders”, with eternal respect and gratitude to the Croatian defenders of the Dubrovnik region, who died under various circumstances in the defense and liberation of southern Croatia during the Homeland War – to those most deserving who ensured that the City of Dubrovnik would remain eternally – the City of Freedom. The mostly features history and many pictures of heroes who fell during the war of 1991. There is no entrance fee. 9) DOMINICAN MONASTERY: This monastery was established in the 13th century and a century later, it became an important part of city’s defense. It’s an exceptionally valuable historic complex for being at a strategic corner of the Old Town, vulnerable to attack from land and sea. Graceful stone steps lead up to the complex. The monastery hides a jewel of a Gothic and Renaissance cloister from 1469 with a thick carpet of grass in the center. This peaceful cloister is something similar to Franciscan Monastery but the garden is more beautiful. Interior of the monastery is delightfully simple with a wooden roof and some fine stone furniture. 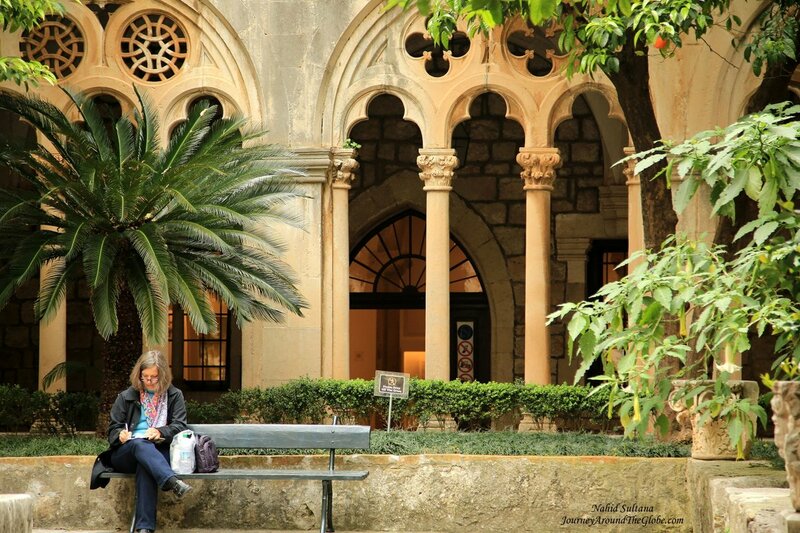 Dominican Monastery, like Franciscan, holds an important library and collection of art including a painting of Dubrovnik before the great earthquake. A small museum holds many old religious paintings and items from the 15th/16th century. 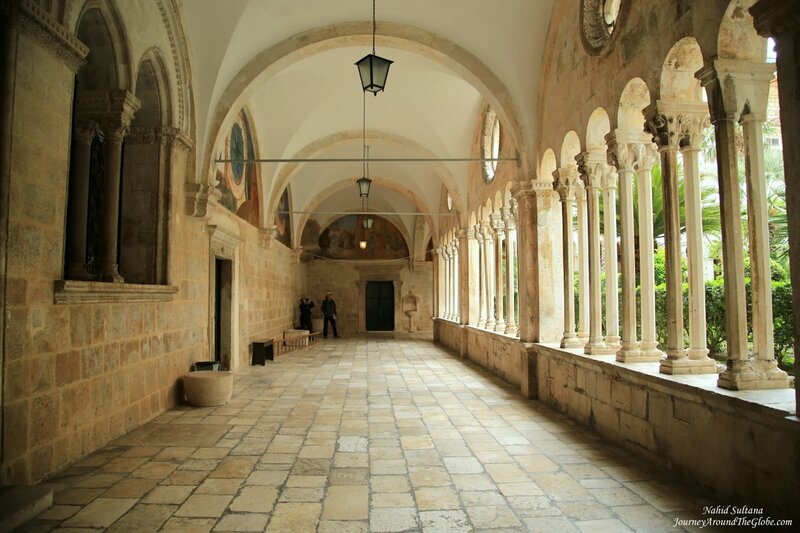 Beside its religious purpose, the monastery represents an important artistic treasury of ancient Dubrovnik. It’s 30kn per person. Visitors have to climb few stairs to the entrance. 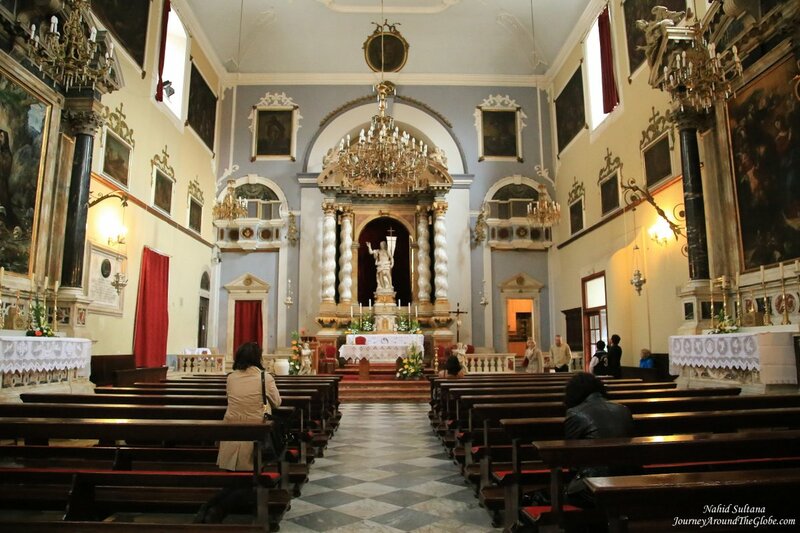 10) ST. BLAISE CHURCH: The church was named after the protector saint of Dubrovnik and perhaps the most beloved church of the locals. 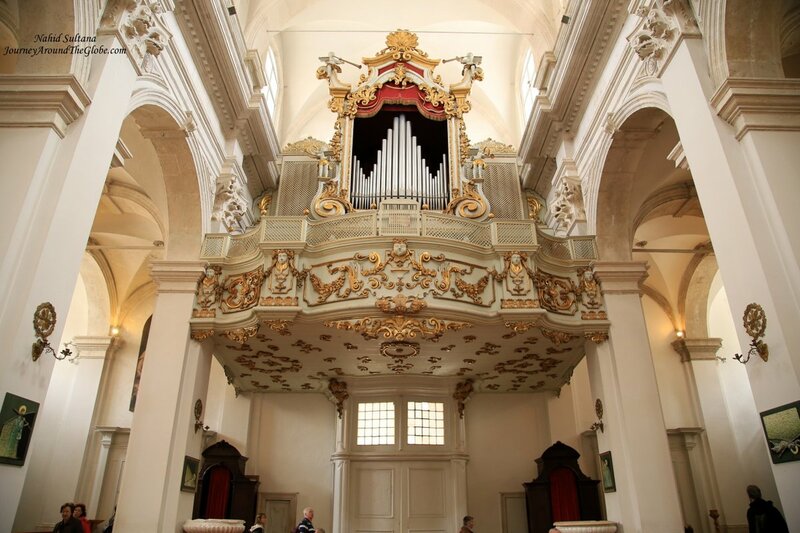 A church has stood on this spot since 1368, but after a fire this new church was built in Baroque style in 1717. The Venetian architect, Marino Gropelli, who designed this church also is the sculptor of the statue of St. Blaise standing above the entrance, protectively holding a scale model of the Old Town in his hand. Inside is pretty small but very elegantly adorned. The church is located on Stradun where Bell Tower and Statue of Orlando are located. There is no fee to enter. 11) SERBIAN ORTHODOX CHURCH: Built in 1877, Dubrovnik’s Orthodox Church stands behind impressive wrought iron gates. The church houses number of icons, mainly Byzantine and Cretan. This is another small but gorgeous church and worth a visit. 12) THE AQUARIUM: This was a treat for our girls. It’s small but it gives you the chance to get to know the sea life of the Adriatic without having to eat it. Our daughters loved the small collection of local sea creatures here. It took us about half an hour to finish it off. The Aquarium is housed in magnificent St. John’s fortress by the marina. It’s 30kn per adult, over 6 is 15kn and infants are free. 13) CITY HARBOR: This harbor was one of my favorites here. It lay at a natural resting point on the maritime trade routes that existed even before the Roman Empire. Now this is the shelter for embarking on a boat tour or for enjoying a good meal. You get a nice view of the harbor if you take the City Wall Walking Tour. 14) GUNDULIC SQUARE: This square come to us as a surprise when we were walking back to Pile Gate at the end of day-2 in Dubrovnik. The square was named after a Baroque poet, Ivan Gundulic, whose verse set the standard for literary Croatian which is still accepted today. His statue in the center of the square was erected in 1893. 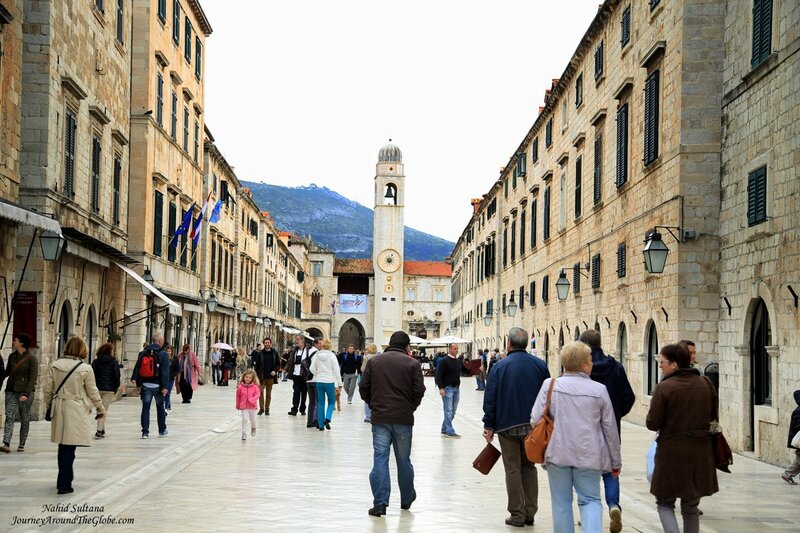 Gundulic Square is bordered by elegant shops, restaurants, and homes the Old Town’s fruit market in the mornings. 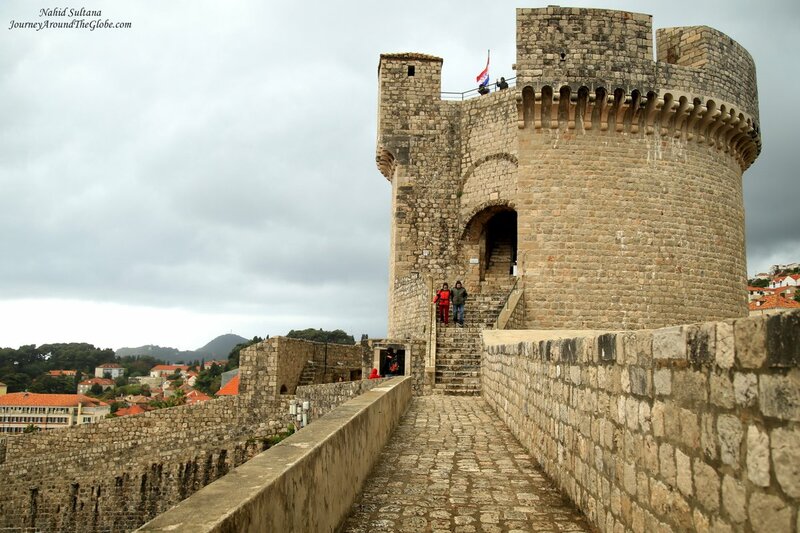 15) CITY WALL WALK: Anyone who walked on the City Wall of Dubrovnik will tell you this is an absolute must. It gives you a different perspective of the old town, its history, and surrounding stunning beauty. You get some of the best shots of Adriatic Sea, Old Fort, terracotta ceilings of Old Town, adjacent Lokrum Island, and the harbor as you walk along the old wall. Almost 2km long, Dubrovnik’s city walls are among the best preserved and most attractive on this planet. There are a total of 1080 stairs throughout the walls. The defenses were built between the 8th and the 16th century. In some places the wall is about 6m thick and they were strengthened by myriad towers and bastions and were never breached. City Wall Walk is 100kn per person and is 2km long. They accept only Kuna or Credit cards, no euros or dollars. There are few different entrances to start your tour on the wall. It took us little more than an hour. But it was first drizzling then started pouring really badly, so we had to take shelter in a shaded area of the walls. There are some small snack bars on the wide parts of the walls where you can sit down for tea or knick-knacks. But for us, that day was a wet and rainy day…at one point we literally had to run to avoid the rain. 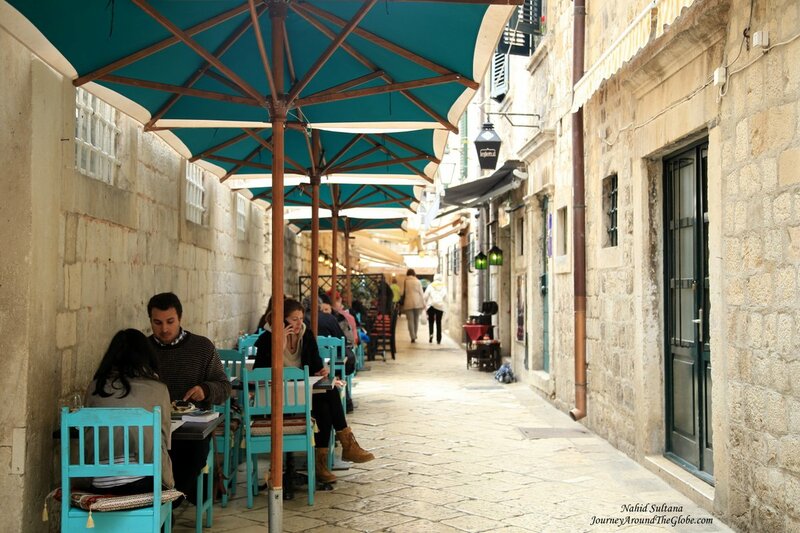 Is Old City of Dubrovnik car free area? Because every time I search for Old City of Dubrovnik I don’t see any vehicles. But I did found out cable car is connected to the city but where? Within the walk is car free, I don’t know much about the cable car. Thanks for this lovely present, truly appreciate your encouragement and support. You’ve done a really good job describing the city. I can’t wait to visit it myself. I really like the Old Town with the small alleyways and lamps above their entrances. Very interesting.The fact that the beach is only 15 minutes away, makes it all the more alluring. The City Wall Walk sounds amazing and one that I’ll definately do. To visit Duvrovnik, one of my dreams! Good post, beautiful place but I think all of the cruise ships have spoilt it a little bit. I stayed in Mlini just outside so could time our visits to avoid the worst of the crowds. Blissful post,the places ,the pictures and the beautiful spirituality in the church. Lovely to read your comments, very accurate except for one small detail. The city wall has a grand total 1,080 steps.